Initial pictures from NASA's Imager for Magnetopause to Aurora Global Exploration (IMAGE) spacecraft are revealing for the first time the global ebb and flow of hot, electrified gas (plasma) around the Earth in response to the solar wind. Severe disturbances in this region controlled by the Earth's magnetic field (the magnetosphere) are capable of disrupting satellites, telephone and radio communications, and power systems. "IMAGE is the first weather satellite for space storms," said Dr. James L. Burch, Principal Investigator for IMAGE at Southwest Research Institute, San Antonio, Texas. "This revolutionary spacecraft makes these invisible storms visible. In a sense, IMAGE allows us to view the Earth through plasma-colored glasses. 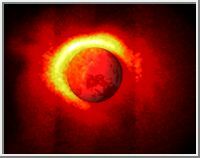 We eagerly anticipate the arrival of severe solar weather associated with solar maximum, which we are now entering." Previous spacecraft explored this turbulent region by detecting particles and fields as they passed through them. This technique limited their vision to small portions of this vast and dynamic region, extending beyond the Moon on the Earth's night side. "The old way of tracking magnetic storms is like trying to understand severe thunderstorms in the Midwest by driving around with a rain gauge out the window," said Dr. Thomas Moore, IMAGE Project Scientist at NASA's Goddard Space Flight Center, Greenbelt, Md. "With IMAGE, we will see the big picture, just like entire storm systems appear on the evening news with weather satellites." The initial pictures from IMAGE will be presented at a press conference during the spring meeting of the American Geophysical Union May 31 at 2 P.M. EDT in Washington, D.C.
"These first images are an enticing glimpse at the spectacular results expected from IMAGE once we encounter really heavy weather in space," said Dr. James Green, Deputy Project Scientist for IMAGE at Goddard. All spacecraft systems have been successfully deployed and are operating normally. All scientific instruments are operating as expected and are returning images. A suite of three Neutral Atom Imaging instruments is recording the glow of fast atoms coming from throughout the Earth's magnetic field. This reveals the shape and motion of the clouds of plasma that make up a magnetic storm. 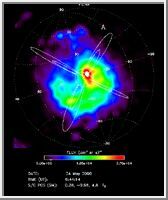 The Far Ultraviolet Imaging instrument is collecting the first-ever images from space of the Earth's proton aurora. The aurora, commonly known as the northern and southern lights, is a ghostly light show seen most often at high latitudes of Earth. The dance of lights that is visible from the ground is caused by electrons striking and lighting up the atmosphere much like electricity lights up a television screen. The proton aurora is invisible to the naked eye and has never been viewed from space; from the ground, it is visible only in far-ultraviolet wavelengths. 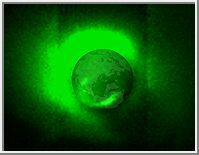 The Extreme Ultraviolet Imager is capturing the first global images of the plasmasphere, which is the tenuous extension of the Earth's electrically charged upper atmosphere, or ionosphere. 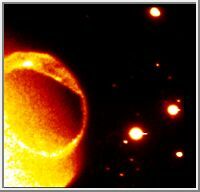 The plasmasphere extends about 12,500 miles (20,000 kilometers) into space. Images from this region will provide a sensitive indicator of the onset of magnetic storm activity. 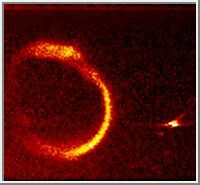 The Radio Plasma Imager instrument provides a three-dimensional view of the plasmasphere by sounding it with radio pulses, like an ultrasound image of the human body. To accomplish this, it uses the longest antennas ever deployed in space, longer than the height of the Empire State Building.